This Labyrinth Lord adventure from New Realms Publishing is something of a follow-up to DM1 The Secret of Eberon's Manor. It's not directly related, but is located in the same general locale (more detailed in one of their other products, Borderlands of Adventure) and is for slightly higher level characters, 2nd-4th level. 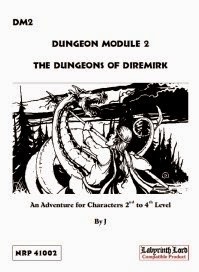 It's a site based adventure, with no real plot except that a man wanders into wherever the PCs presumably are, collapses while saying the word "Diremirk". When he wakes up, he relates a tale of his companions exploring the ruins of the place and getting mauled by monsters, so he fled. Presumably the PCs will go and avenge and/or rescue his companions. The journey to Diremirk isn't detailed, left to the DM's imagination (or presumably that other product, Borderlands of Adventure). The upper portion of the ruins are, though, as well as two dungeon levels below. The upper and first level are quite small, about 6 locations each, with the second level of the dungeon being about 40, and the real meat of the product. Each location is well described, with a boxed (in this case grey) paragraph to read to describe the room, and then more detail for the DM.For the most part, all the monsters in it are standard and quite common. Skeletons, zombies, ogres, goblins and bugbears most notably, though the bugbears do have levels in cleric, so aren't just normal bugbears. I thought perhaps that the artist was the same as the author, since both use "J" as their name. But it turns out the art is actually stock art by Jason Walton. Pretty decent art though, and apparently reasonably priced. The maps are original though. Unfortunately, at least to my mind, they are done in color. The outdoor map works well enough, but the dungeon maps are gray on brown, with black lettering. The second level in particular is difficult to read, since it's a large level and the map is set horizontally on a page so it's not nearly as big enough as it should be.